Australia: US Copyright Colony or Just a Good Friend? Collectively, we Australians can be a cowardly bunch, so scared of an unknown invader that we will sell our sovereignty for the illusion of protection. This fear is symbolised in the movie 'Tomorrow When the War Began,' a film of dubious quality that portrays an Australia under invasion from some shadowy Asiatic power. 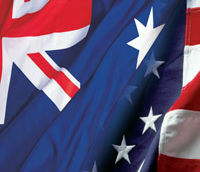 The foundation-stone of Australia’s defence policy is our alliance with the United States. Known as the ANZUS treaty, on paper this alliance guarantees mutual defence. In practice, the friendship is far from equal. As with their treatment of sovereign nations the world over, the Americans have no qualms about interfering in our domestic politics and local legal systems. The kind of behaviour that, if reciprocated, would swiftly end the alliance. The latest front in this meddling is the crossover between file-sharing and intellectual property. Individually, Australians can show enormous courage. Currently, an Australian is enduring a lengthy legal battle that may see him end up as an inmate at Guantanamo Bay, or worse. Julian Assange and the Wikileaks organisation he help found shone a sterilising light on the behaviour of the US Embassy in Australia’s capital, Canberra. For his bravery Australian Prime Minister Julia Gillard, a trained lawyer, prejudiced any future legal action by prematurely labelling Assange’s actions “illegal.” She has since sacked the Attorney-General whose job it was to give legal advice on the Wikileaks matter, but the damage has been done and the comment has never been retracted. While the Gillard Government was quick to shoot the messenger, it has remained eerily silent on the message – one of potential interference in domestic legal affairs by a foreign power and so-called ally. The Canberra Wikileaks cables revealed the US Embassy sanctioned a conspiracy by Hollywood studios to target Australian communications company iiNet through the local court-system, with the aim of establishing a binding common-law precedent which would make ISPs responsible for the unauthorised file-sharing of their customers. Both the location, Australia, and the target, iiNet, were carefully selected. A precedent set in Australia would be influential in countries with comparable legal systems such as Canada, India, New Zealand and Great Britain. Australian telecommunications giant Telstra was judged too large for the purposes of the attack. Owing to its smaller size and more limited resources, iiNet was gauged the perfect candidate. Had either been caught spilling secrets to any other national government, with the possible exception of Great Britain, they would have seen their reputations destroyed at best. At worst, been put on trial for treason. The mere hint of back-room dealings with Australia’s largest trading partner, China, has toppled political careers. Senator Arbib was recently promoted to Assistant Treasurer by the Prime Minister he helped put in office. Without further leaks, we cannot know if Arbib still reports to his American handlers. Prime Minister Gillard made her feelings towards America known when she addressed the US Congress in March, 2011 and proclaimed, somewhat sycophantically, “You can do anything.” This is not the diplomatic language of allies. It is the language of worship. Many Australians believe we are special, that the US really does hold us in the highest regard, reinforced by frequent utterings from successive US administrations that America “has no better friend” than Australia. Unfortunately, such a reality is challenged by the even more frequent utterings that the US has no better friend than Canada, Great Britain, France, Italy, Israel, Japan, Poland and South Korea. The “Australian” Federation Against Copyright Theft (AFACT), a consortium of American movie studios with token Australian representation, began legal action against iiNet in November, 2008. The MPA and US Embassy badly misjudged their target. In tenacious Australian fashion, iiNet put up the legal fight of their lives. AFACT lost the case and all subsequent appeals. Next month, the final episode of this long saga will culminate with a full ruling of the Australian High Court. AFACT is already preparing for a loss in February by shifting its focus to lobbying the Australian Government directly. The process began behind closed doors late last year when meetings were held between AFACT, linked copyright industry lobbyists, the Federal Attorney-General’s department and a coalition of Australian ISPs. The voting public have not been told what was discussed or what plans have been developed. If the High Court rules against AFACT and its Hollywood and US Government backers, as every lower court has done thus far, Australia will be faced with a test of national sovereignty. Only Australia’s Federal Parliament can overturn the decision. With a Prime Minister visibly enamoured with the United States and known informers in the Federal Ministry, there is a strong likelihood any win for iiNet will herald changes in Australian law. It is unlikely those changes will be friendly to an open file-sharing culture. Myles Peterson is an Australian Journalist & Writer. c There are 191 comments. Add yours?